An exhibition from Britain on mechanical moving toys, was held on the 2nd floor of the Shanghai Science & Technology Museum from December 24, 2016, to March 23, 2017. Altogether 50 mechanical moving toys were presented to audiences. Visitors were able to learn about the mechanics of moving toys that combine technology and entertainment, and the exhibition entranced visitors to feel the beauty of mechanical moving toys and realize the principles of mechanics. Ten large performing automatas from Sharmanka Kinetic Theatre in Glasgow, Scotland,were made by Russian sculptor-mechanic master Eduard Bersudsky. 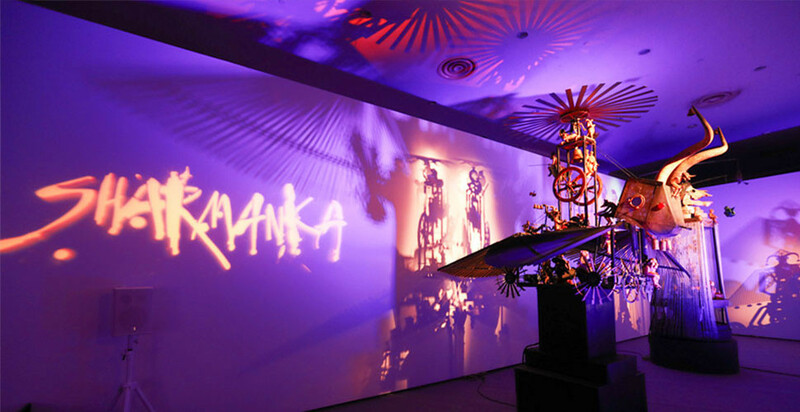 Each performing automata was accompanied by a unique light show and music. The 10 large automatas performed in turn, presenting a super show with the combination of mechanics, lights, music and story. Another 40 smaller automata from Cabaret Mechanical Theatre of London were handmade by famouse British mechanical-designers. They could control the toys’movements with buttons and visitors could have a closer look at how mechanical tools, such as levers, cams and gears, made the figures move. Apart from watching the performance of automata, visitors also had a hands-on opportunity to build automata by themselves.